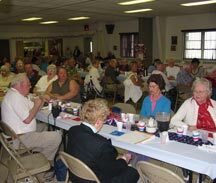 Senior Dining Program - Friendship Café located at Our Lady of Fatima Church, Bishop Scully Hall, Monday, Wednesday and Friday, 10am-2pm. Catholic Charities Senior & Caregiver Support Services “Friendship Café”, located at Our Lady of Fatima Church, is a gathering place for seniors. Seniors enjoy meeting up with friends, enjoy a nutritious mid-day meal and participate in diverse activities that offer seniors the opportunity to remain active and connected to the community while meeting their nutritional needs. Initial Assessment and Periodic Reassessments for eligibility are required. Assistance with accessing additional resources is available if needed. If you, or somebody you know would be interested in finding out more about our program for area senior citizens, please call the center at (518) 257-7601.